On Sunday 17th Feb, Rebecca Hannah enjoyed a great run in the Round The Bays Bluebridge 10K in Wellington, New Zealand, clocking a time of 1:06:03 and coming 710th of 1,535 female finishers from a total field of 2,744. February is the hottest month of the year in New Zealand and temperatures reached into the mid 20s, so too hot for a PB but, nevertheless, a great atmosphere and tremendous scenery. Over 10,000 runners took part in all the various races, which also included kids’ fun runs and a quarter and half marathon event. On the same day, back in good old East Anglia, Lisa Jennings and Caroline McIntosh both competed in the Marriot’s Way Half Marathon, which goes from Norwich to Aylsham in Norfolk. The weather was lovely but conditions were reportedly fairly tough on the footpaths and trails. Lisa and Caroline recorded times of 2:31:34 and 2:33:22, which were good efforts on this off-road route. 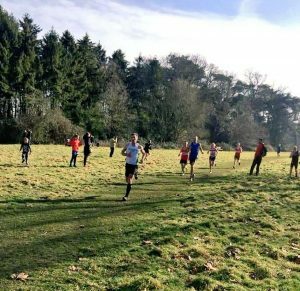 It was the Bury St Edmunds XC Suffolk Winter League fixture in Nowton Park on Sunday, where Newmarket Joggers, as usual, formed a combined team with Sudbury Joggers. Out of a total field of about 330 runners, there were 39 in our team, consisting of 25 men and 14 women, with 28 Newmarket Joggers and 11 Sudbury Joggers. Top Newmarket Joggers’ performances by the men over this new estimated 5.1 mile route (shorter this year) were from Neil Pollard (1st for the team, 4th overall) and Sam Sadler (3rd for the team and 19th), who clocked provisional times of 29:08 and 31:22. Kieran Hayles of Sudbury Joggers was 2nd for the team and 18th overall. Isabella Soro (130th) and Emma Newman (137th) had great runs and were 2nd and 3rd for the women’s team behind Sandy Thorogood (103rd) of Sudbury Joggers. Other Newmarket Joggers finishers were, for the women: Ruth Eberhardt (196th), Hannah Parsons (197th), Jan Holmes (244th), Jill O’Grady (252nd), Rebecca Fordham (259th), Svitlana Zinchenko (271st), Sianie Painter (272nd) and Jenny Osbourn (324th), and for the men: Mark Hayward (43rd), Greg Davis (48th), Chris Howell (51st), James Thomson (75th), Jamie Rule (85th), Henry Hamilton (94th), Jon Brooker (101st), Marc Drury (106th), Neville Clarke (122nd), Daryl Moran (172nd), Clive Purbrook (177th), Jeremy Reader (200th), Malcolm Osbourn (241st), Chris Aylmer (264th) and Jim Withers (283rd). Official times may take a week or so to come through. So far in the League, after 3 fixtures, we have four Joggers leading their individual age categories: Neil Pollard 1st of 67 in MV40, Paul Holley 1st of 63 in MV50, Neville Clarke 1st of 16 in MV65 and Malcolm Osbourn 1st of 12 in MV70+, so things looking pretty positive. Please let us know about your race results, particularly the lower profile or more distant ones which might be missed, by emailing chris.aylmer@newmarketjoggers.co.uk. Your best times in the current year over the various distances can then be added to the club achievement tables.